Why every year do we set New Year’s resolutions with the vigor of a high school student on a first date and weeks later sit defeated like a boxer stuck on his stool? We take on too much too soon. We plan big and fail hard. 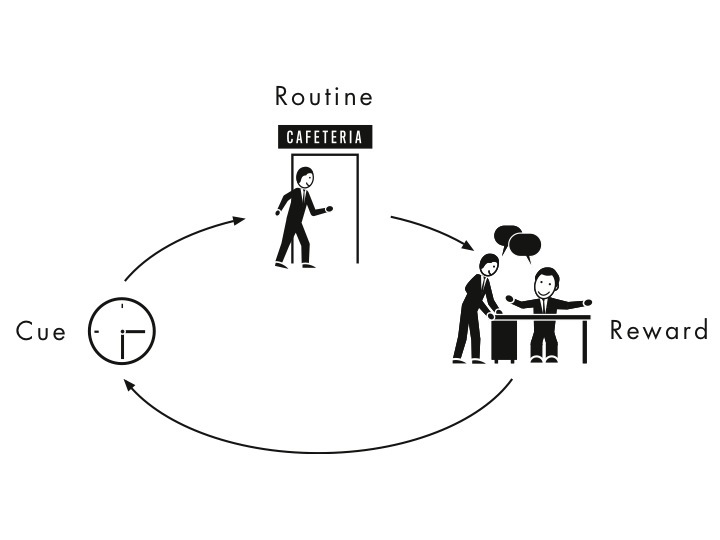 As Charles Duhigg described in The Power of Habit, habits require a trigger for your routine and a subsequent reward to reinforce the cycle as pictured here. The problem is that our resolutions tend to have a large scope with long feedback cycles. Here are some common goals. These might be reasonable goals if you’re already losing weight, exercising regularly, or saving money. Often our goals are much bigger lifestyle changes as you can see with the additional details below. Not only do you have to stop the bleeding, but you have to reverse the momentum all in a short period of time. We set ourselves up to fail. We have limited willpower. If you can focus all your energy on just one lofty goal, you might succeed. More likely you have work, kids, parents, school, bills, and stress eating away at your willpower from the moment you wake up until you fall asleep. So what can you do? Use the J-Curve of Habit Change to your advantage. Make your goals smaller and your feedback cycles shorter. The J-Curve (pictured below) is a concept applicable to many disciplines. In software development we apply it to process improvements. Instead of massive changes to how we work every year, we continuously improve every 2-4 weeks using small changes. In the short-term our productivity suffers as we invest time learning a new way of working. Eventually, that new way of working yields benefits and our productivity improves surpassing our original performance. If we keep the changes small enough, we get feedback quicker re-motivating us to continue improving or allowing us to change direction faster if we don’t see improvement. Imagine the J-Curve applied to your goals like the examples noted above. You want to lose 30 pounds in 5 months (6 pounds per month) and plan to spend an hour per day in the gym, but you only lost 2 pounds the first month. You don’t want to invest another month to lose only another 2 pounds, but you don’t know what else to do. You quit. That’s terrible. You were gaining two pounds per month before and now you’re losing two pounds per month. That’s awesome! It’s only ’not awesome‘ when viewed through a frame of reference focused on losing 6 pounds per month. You set your goal too high, made good progress, but demoralized yourself by not fully realizing your goal. You took on a large hard goal and quit in the red zone pictured below before you could see the hope in the green zone when you begin to see massive improvement. A better option for most people would be to set a goal to lose 2 pounds the first month. This is a more realistic goal given that you’ve been gaining weight regularly. Plus, instead of weighing yourself every month you’ll weigh yourself weekly aiming to lose 1/2 pound per week. Now you have four chances each month (as shown in the smaller J-Curve graphs below) to adjust your tactics instead of just one. Maybe, after two weeks you decide you need to focus more on eating clean and you lose 4 pounds the first month. Bonus. That’s the J-Curve of Habit Change. You may wonder what the point is of setting a goal that’s so easy you can’t fail. The point is that any exercise is better than no exercise. Any increase in clean eating is better than junk food. Saving any money is better than saving no money. Getting started, creating positive feedback, and building momentum greases the grooves for success. You’re not competing against everyone else with your goals. You’re improving yourself. Be proud when accomplish a goal, no matter how small. Then set another goal that’s a little harder but still easy enough that you can’t fail. If you repeat this process frequently, you’ll improve massively and acquire a champion’s mindset. For your feedback loop set a regular schedule to check-in on your progress, reflect on your accomplishments and failures, and make adjustments. A weekly check-in establishes a good cadence for most goals. Create SMART goals that allow you to assess whether you’re on-track, ahead, or behind. The J-Curve of Habit Change illustrates the price you pay to improve yourself. Remember when you’re in the early phases of a new habit marching towards the bottom of the J-Curve that the payoff on a habit change is always darkest before the dawn. If you recommit to your habit change, set goals so easy you can’t fail, and create short feedback loops, you’re close to realizing the benefits of your investment in yourself. That hope, grit, and strategy is the key to your success.